In today’s Opera stable update, we have included some fixes for resuming downloads and HiDPI. We also fixed the ‘Part of tab not clickable for activation’ bug on macOS. Chromium updated to version 61.0.3163.100. As usual, you can find all the details in the changelog. 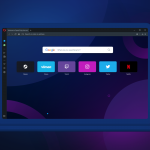 Previous article: Opera Developer 50 initial releaseNext article: Opera 49 beta – Share the web like never before with snapshots and selfies.